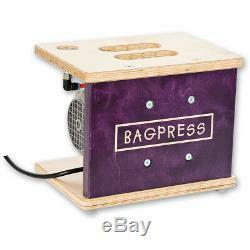 Bagpress PRO4 Electric Vacuum Press. View search results for Bagpress. 4m³ per hour professional vacuum press system. 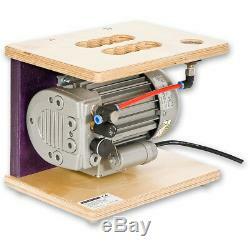 100% cycle dry running rotary vane pump. Built in vacuum gauge and heavy duty foot control switch. 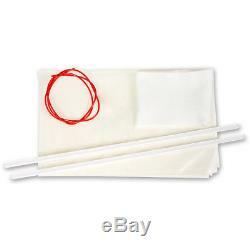 1,300 x 2,500mm, 300 micron seamless polyurethane bag. Lacquered birch ply protective frame with carrying handles. Ideal for single bag veneering and laminating operations. Vacuum pressing is the most effective way to clamp veneering work and light weight laminations, providing an even and massive clamping pressure over the whole surface. By extracting the air from the vacuum bag and creating a vacuum, the full weight of atmospheric pressure bears down on the contents of the bag exerting an evenly distributed pressure of around 8.5 tons per m². These units use a top quality Becker dry running vane vacuum pump giving between 4 and 25m³ per hour developing 85% vacuum. A built in vacuum gauge gives a visual indication of performance whilst a heavy duty foot switch gives convenient control. An extra large capacity 2,500 x 1,300mm heavy duty 300 micron seamless vacuum bag is supplied as standard and will accommodate almost any project. The 16 and 25m³ units will run up to 4 bags simultaneously. A convenient storage box houses the pump unit. If you are laminating with a vacuum press it is only necessary to provide a one piece former as the vacuum bag will provide an even pressure as it moulds the timber into the shape of the former. Overall L x W x H. 300 mm x 2,500 mm. This means the driver is only contracted to deliver to the outside of the premises and may need assistance offloading. If the item is damaged or faulty we will typically repair the machine or provide spare parts, dependant on the fault. We will use our respective carrier service or provide a free post label for the return of any goods which are "Faulty", "Not As Described" or "Damaged" only. You then have 30 days in which to return the product, providing it is unused and in the same condition as per received. Transport packaging should be sufficient for the method of carriage. We cannot accept any responsibility for damage caused by your carrier. We will endeavour to rectify any issues you may have with your item/s or if there are any discrepancies with the description, in relation to the item/s received. Health, Safety & Workwear (PPE). 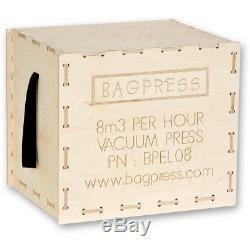 The item "Bagpress PRO4 Electric Vacuum Press" is in sale since Saturday, January 12, 2019. This item is in the category "Business, Office & Industrial\Hand Tools\Vices".